Seat(s): This seat’s got generous width, a lie-flat bed and room to stretch when upright…Good, right? Well, yes but it’s also just plain comfortable. If it’s not just because the seats were still brand new-ish when we flew, it feels like there’s potential for a fairly decent nights sleep here. Some seats get you closer to the window in this American Airlines 787 Business Class cabin but all have aisle access, so it’s easy to get up and move around in-flight. Barely broken in here, this American Airlines 787 Business Class Suite helps put the dream into Dreamliner. Tech/Connectivity/Entertainment: Everything you’ve likely come to expect from a long-haul business class seat is here tech and entertainment-wise from outlets to wi-fi. It took some work to sign into the wi-fi portal but once in, speeds were enough to do all but video stream. Sorry livecasting bloggers, it’s not ready yet. The on-demand entertainment system is the same as what we found on board American Airlines A321 transcon service. The interface is clunky and we found ourselves occasionally having to assertively press both the touch-sensitive remote and screen to get a movie or TV show to start up. The selection is decent though. We found movies, games and TV programming that would help pass time on a much longer flight than this 2 hour hop. Our short Modhop from Chicago to Dallas just got us a salad, but expect more on your long-haul. Food: Mealtime on your international flight should be a more grandiose affair. Our domestic flight go us Americans signature mixed nuts, a chicken salad with chicken on the side and a warm chocolate chip cookie to wrap things up. Service: A new workspace seems to lift spirits at any job so it was no surprise that this crew was fairly upbeat. By this time flight attendants were familiar with this American Airlines 787 and were able to help with little things like putting my seatbelt on (I actually had trouble with this) and flipping through the pretty cool map on your entertainment unit. How we got em’: Used one-way domestic saver award (25,000) to get from Newark to Dallas via Chicago. 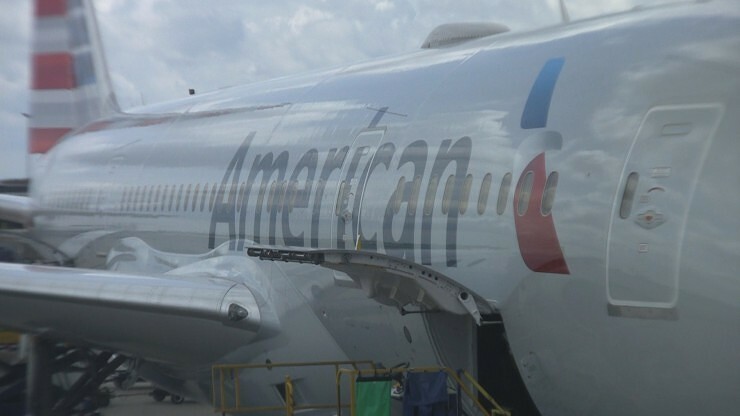 This isn’t typically a reccomended use of your miles but good to have available in a pinch and for us, a great chance to fly aboard this (at the time) brand new American Airlines 787 Dreamliner. *Rating could vary on international routes based on service, meal and long-haul amenities.